Mirus Gallery Denver is pleased to present L'Avenir, a Graffuturism group exhibition curated by Poesia. The opening reception with be Friday, April 26th, VIP/Press Opening 5:30-7 PM then general admission from 7-10pm, and the exhition is free and open to the public for viewing through May 25th, 2019. L'Avenir features a group of like-minded artists that flourish under the banner of Graffuturism, a term coined by artist and arts commentator Poesia, who edits and publishes an online blog under the same name, Graffuturism.com. Taking inspiration from French philosopher Jacques Derrida and his axiom The coming of the Other, L'Avenir literally translates as "the future," and is a direct reference to the progressive and contemporary element that has influenced this intercontinental group of individuals known for creating a distinct aesthetic of their own. 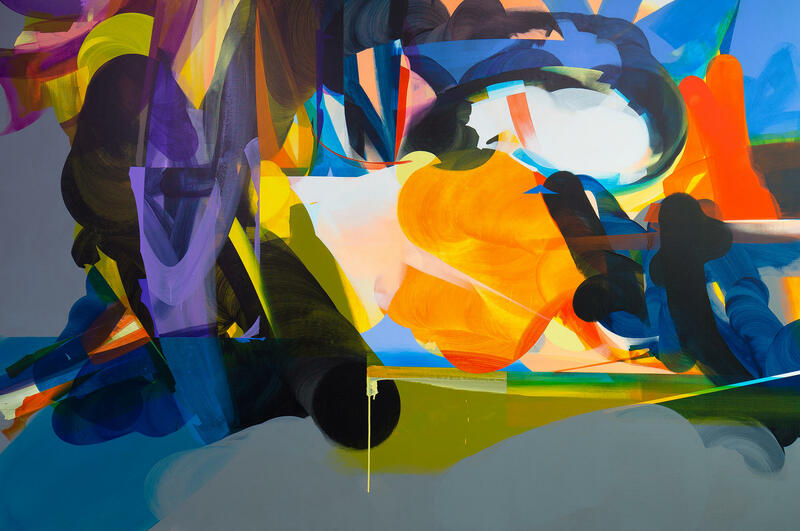 L'Avenir brings this group of graffiti inspired contemporary artists crashing into our visual field with an exciting celebration of the neo-contemporary Graffuturism movement. We are at a special time and moment in our art form. We are embraced by the mainstream and are able to engage the public like no other form of contemporary art, yet we remain outside of the academia so to speak. What once was avant-garde now caters to a small group of pseudo intellectuals that push theory over practice in most cases in our current art world. By secluding themselves from the mainstream through a form of elitism, it has opened a gap allowing other subcultures and art forms to grab the public’s attention. Graffiti was born in the 1960s and is thus coincidentally post-historical in nature. Graffiti developed as a subculture that manifested outside of the institutional fine art historical narrative, bursting onto the cultural stage with its own set of rules and established its own concepts and aesthetics. We were all born from this initial moment forty-plus years ago, and are starting to utilize this personal history to fuse with influences from outside of our art form. This break from many of the traditional elements of graffiti started at about the same time Street Art emerged as a bubble of renewed cultural interest in the early 2000’s. Because Street Art was able to garner a large following due to its use of representational imagery and readable text, a Graffiti/Urban Art hybrid started to form as younger artists utilized aesthetics from all categories of art on the street, as well as historical forms. There has always been exceptions to this rule, and those artists who were able to see this sooner than others. Progressive hybridization of graffiti has a history going back to the 1970s with artists such as Futura and Rammellzee, yet todays progression is taking place on a much larger scale. Through Graffuturism we have found a base to have this conversation amongst each other. We move forward with or without the acceptance of academia, engaging the world the only way we know how – through our work in the streets and in the studio. The latter engages an older system of art with a structure much different than the art we create on the streets for ourselves and the public. Without the context of our street work, our studio work would seem impure, dishonest, out of place and out of context. We will not tell you how to engage with our art. We only ask you to look further than the canvas. Set your gaze upon the whole rather than the constituent parts and acknowledge what is to come – L’Avenir in the past, present and future tense.